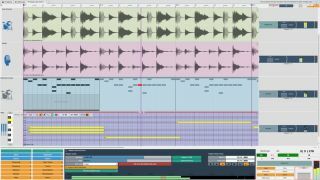 Tracktion 6 looks to pack more into its single screen than previous versions. Having been subjected to public beta testing for four months, Tracktion 6 is now available. This upgrade to the single-screen DAW offers many new features and options. One of the main highlights is said to be the implementation of Z-Plane's Elastique Pro timestretch algorithm, which is used to power the new Warp Time audio editing features. Tracktion 6 also offers tape-style start/stop effect handles for audio clips, dedicated submix and automation tracks, a comprehensive tagging editor, an upgraded plugin management system, a new "super comp" audio compiling tool and more. Tracktion 6 users will also have access to the software's new 'Marketplace', which enables in-app purchasing of the likes of plugins, sounds and instruments. Tracktion 6 is available now for PC and Mac priced at $60. Upgrades from previous versions cost $30. You can find out more and download a demo at the Tracktion website.